Screen Ages is a valuable guide for students exploring the complex and vibrant history of US cinema and showing how this film culture has grown, changed and developed. Covering key periods from across American cinema history, John Alberti explores the social, technological and political forces that have shaped cinematic output and the varied impacts cinema of on US society. Glossary terms featured throughout the text, to aid non-specialist students and expand the readers understanding of changing screen cultures. 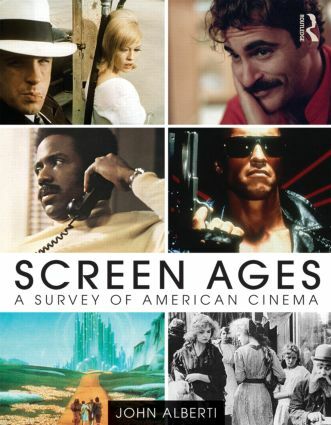 Screen Ages illustrates how the history of US cinema has always been and continues to be one of multiple screens, audiences, venues, and markets. It is an essential text for all those wanting to understand of power of American cinema throughout history and the challenges for its future. The book is also supported by a companion website, featuring additional case studies, an interactive blog, a quiz bank for each chapter and an online chapter, ‘Screen Ages Today’ that will be updated to discuss the latest developments in American cinema. ‘Screen Ages acknowledges that the reason we study film is because, first and foremost, we love to watch movies. John Alberti has contextualized the history of cinema within that frame, which is always simultaneously about the craft of making movies and the pleasure of watching them. This text is exceptionally well suited to student learning because Alberti makes it relevant for them, connecting the past to the present in creative ways—for example, linking the Kinetoscope to YouTube. An especially valuable and unique feature of this text is its exploration of gender genres across time, which shows how the changing nature of gender roles have been at times challenged and at others reinforced by movies and moviegoing in American culture. Furthermore, Alberti’s inclusion of women in film from Alice Guy-Blaché to Lena Dunham offers a more diverse analysis of filmmaking than other textbooks. Screen Ages is comprehensive in its coverage of the history of cinema, accessible in its clear design and approachable style, and a genuine contribution the field.’ Laura Mattoon D'Amore, Assistant Professor of American Studies, Roger Williams University and editor of Smart Chicks on Screen: Representing Women's Intellect in Film and Television. John Alberti is Director of Graduate Studies and Director of Cinema Studies in the Department of English at Northern Kentucky University, USA. His previous books included The Working Life: Readings on Work, Labor, and Career, Leaving Springfield: The Simpsons and the Possibilities of Oppositional Culture, and The Canon in the Classroom: Pedagogical Implications of Canon Revision in American Literature.